An eerie incident that shook the people involved. 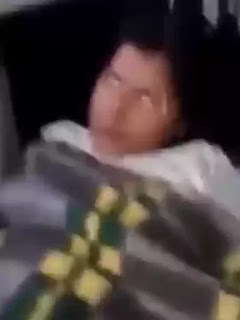 A woman possessed by a demon spirit has been rushed to hospital amidst a scary demonic fit. The woman's name is Carmela. And as she lay on a stretcher in an ambulance taking her to the hospital with several medics by her side, a terrifying display of demonic possession took place within the confines of the ambulance. The delirious woman Carmela who is believed to be possessed by a demon spirit began to lurch on her stretcher, moving backwards and forward. Her eyes bulged and shone white as they rolled to the back of her head. Her friends tried and failed to restrain her and someone attempted to wake her by slapping her face. But it was then that Carmela shocked everyone in the ambulance. The hoarse voice that emanated from her was nothing like her own. It was a bone chilling voice that uttered words that terrified everyone present. "She is going to hell." the voice said. "This girl doesn’t exist now. It doesn’t exist." "My father is coming for him. He is mine. He is for me." This unsettling incident occurred during a ride in a speeding ambulance with blaring sirens. The medical vehicle was taking Carmela to the hospital after she had horrified shoppers at a supermarket with fits that appeared to be demon possession or mental illness? Those who witnessed this strange occurrence are still baffled by the eerie and inexplicable nature of what took place.